Having lost their mother, Mary, under mysterious paranormal circumstances at an early age, young Sam and Dean Winchester are raised by their father, who, driven by revenge, becomes an obsessive hunter and destroyer of supernatural creatures and entities. Years later, when their father mysteriously disappears and Sam’s girlfriend is killed in similar circumstances as their mother, the Winchester brothers follow in their father’s footsteps, travelling the back-roads, highways and byways of America in search of answers and vengeance. It is a journey that brings them face-to-face with unimaginable horrors, from demons and vampires to ghosts and shape-shifters, unites them with loyal allies and reveals their eventual and totally unexpected destinies. Made with the blessing and creative input of the original show’s creator, Eric Kripke, and featuring the vocal talents of the live-action series stars, this animated series brilliantly covers the events of the first two seasons of Supernatural by recreating many of the original episodes while also introducing a whole batch of brand new material that explores the Winchesters’ previously unseen childhoods and expanding upon the stories of several secondary characters. The series has certainly attracted its share of enthusiastic reviews, DVD Talk saying of it, Impressively sleek and efficient… the scale of the visuals is a lot more ambitious than anything live-action network TV could ever hope to match," and Fangoria had this to say: "Highly recommended. Don’t waste a minute – get your hands on this must-have set! If you haven’t watched a single episode of Supernatural, this is a perfect opportunity for new viewers to jump in." The series was co-directed by Atsuko Ishizuka (Aoi Bungaku; Top Secret – The Revelation; NANA; MONSTER) and Shigeyuki Miya (Lupin III; Blade; Bleach; High School Of The Dead), and production studio Madhouse (Ninja Scroll; Paprika; Summer Wars; The Girl Who Leapt Through Time; Death Note). 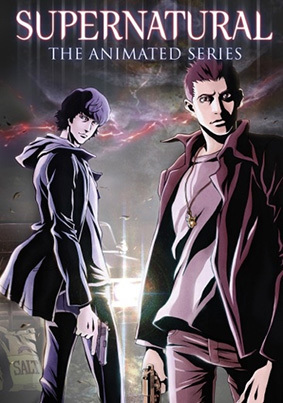 Supernatural: The Animeted Series will be released on UK DVD on 27th May 2013 by Warner Bros at the RRP of £29.99.